I thought I might title this review “A Tale of Two Piattos”. In a way it makes sense. Although the food is interchangeable at each St. John’s location everything else is different. 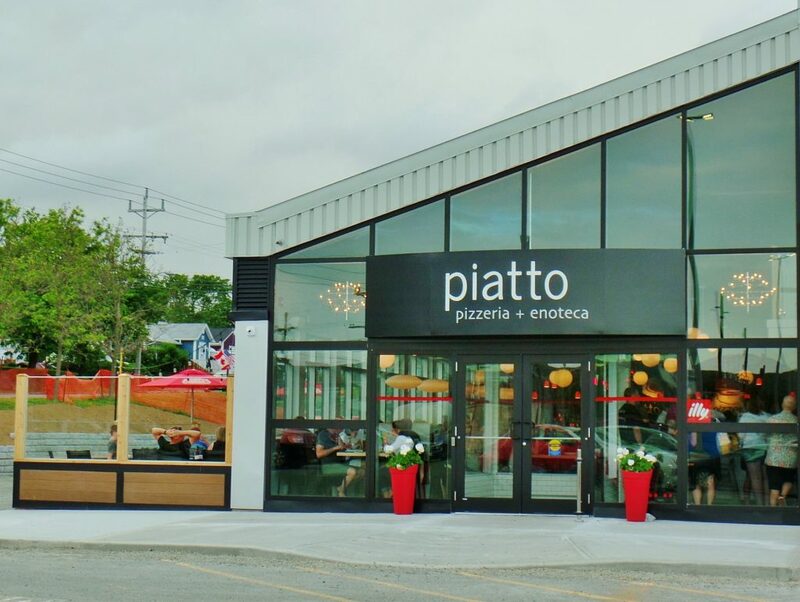 The experience you’ll have at Piatto on Elizabeth Avenue is not the experience you’ll have at Piatto on Duckworth Street. The former is Rock and Roll, the latter Swing. 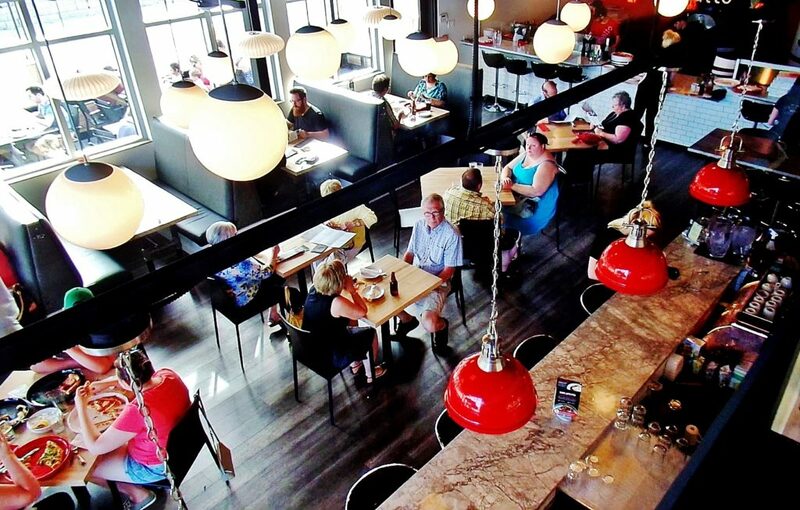 Piatto on Duckworth is a destination restaurant, a place you choose for a night out in downtown St. John’s. 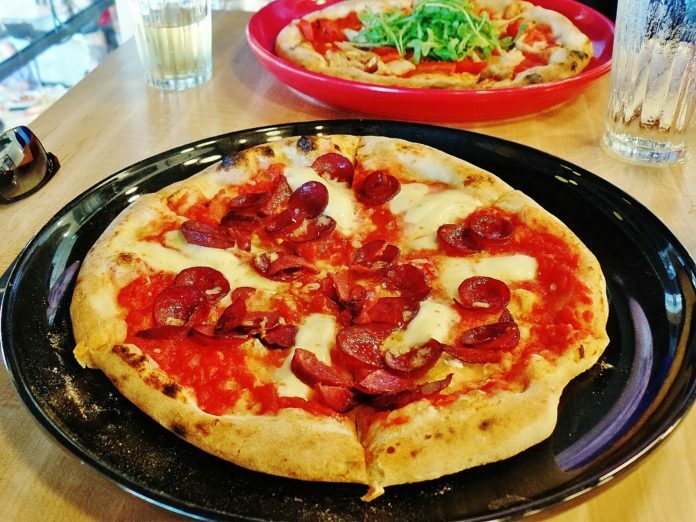 It has an open kitchen and serves pizza, but essentially the experience available there is similar to that of most independently owned restaurants on Duckworth and Water. I had no idea what the newest Piatto would be like. It was built from scratch inside what used to be the garden centre of Canadian Tire on Elizabeth Avenue. Leon’s Furniture is the building’s main tenant. Pearly white subway tile, a long marble dining counter under pendant light fixtures with fire engine red shades made a strong first impression. Opposite the counter were booths for four, and in the middle of the hardwood floor, an arrangement of tables for two and four. A couple of large wood burning pizza ovens were being tended at the back of the kitchen. A walled off outdoor patio was as busy as the indoor rooms. More interesting to me, and where we were eventually seated, was a loft overlooking the restaurant. Decorated in a stark black and light theme the space featured many black and white photos taken in the fifties and sixties. Each featured either classic Italian cars or bikes: Ferrari, Fiat and Vespa. One or two images looked like they could have come from a Vittorio De Sica movie. Apart from sharing a few decorative touches (like those photos) Piatto on Elizabeth Avenue is miles apart (figuratively and literally) from the warm, comfy, vintage setting of Piatto downtown. Midtown Piatto is the difference between mart and boutique. It’s a noisy, bright family restaurant where people intend to eat and run, not spend an hour or two nursing a glass of wine while nibbling marinated olives and finishing with pizza and panna cotta. A friend of mine is crazy for Aperol, an aperitivo that tastes mainly of bitter orange. 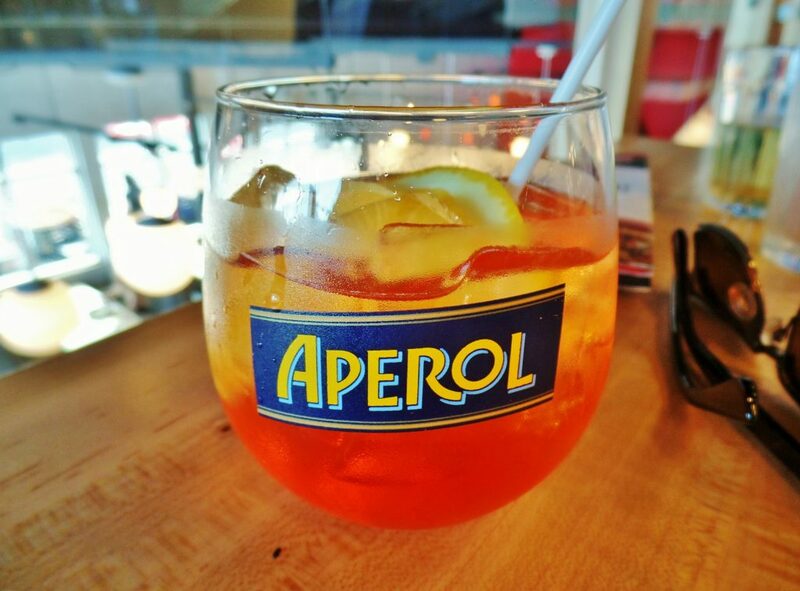 To be more specific, she’s crazy about a cocktail called Aperol Spritz. She suggested I try one since the Italian themed pizzeria had them on the cocktail list. It wasn’t a hard sell. I’ll try anything once. It’s an easy recipe: three parts prosecco, two parts Aperol and one part soda, finished with a slice of fresh orange. Herbaceous notes were present but mostly the spritz tasted of biting orange. Piatto’s Aperol Spritz lived up to my friend’s description of it as “a very refreshing summer drink”. Piatto’s bruschetta is focaccia with a topping of chopped fresh tomato (marinated in olive oil, garlic and basil). Bread and fresh tomato make a delicious match on their own; add good quality olive oil and fresh garlic and you’ve got a starter that will stimulate your taste buds and make you hungry for what follows. The kale craze that started two or three years ago in restaurants up-along is hitting St. John’s. I’ve been in several restaurants lately where kale has been served, either deep-fried, unadorned, or as a salad. Piatto’s kale salad also included toasted quinoa, feta and dried cranberries (speaking of ubiquitous). Kale is tougher than lettuce but not as tough as cabbage. 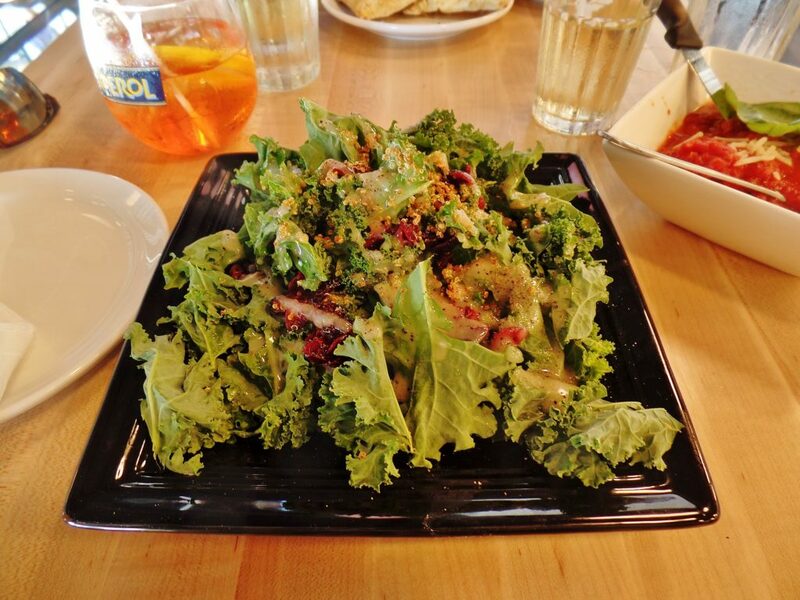 Poppy seed dressing and the various textures made Piatto’s kale salad a success. Fior di latte mozzarella balls are pretty good on their own. 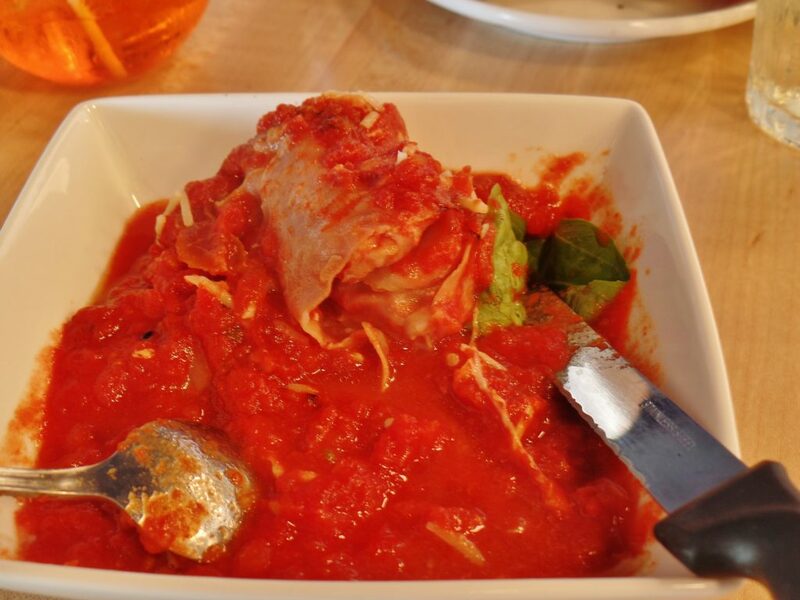 Wrap them in prosciutto and bake them in San Marzano tomato sauce and you’ve got a dish called Pacchi di Prosciutto. It could also be called Southern Italy in a Bowl. Many Italian dishes fall into the comfort food category. This is one of them. Salty, sweet ham and melting cheese in bright flavoured Italian tomato sauce is, well, fantastico. Naturally we ordered a couple of pizza pies. Piatto is happy to create a pizza from any of its ingredients for you. Guest has a dairy sensitivity, so one of our pies came without cheese. It was coated with tomato sauce, pulled chicken and a handful of fresh arugula. It was good, although I would have liked some olive oil drizzled over this particular pie just before serving. Piatto’s Americana pizza looked especially attractive on a black plate. It was a perfect wood fired pizza. A background of red sauce was interrupted by lashings of fresh fior di latte mozzarella and hand sliced pepperoni. Nothing more was needed. Excess would have been a mistake. Piatto’s pie was another example of a few quality ingredients being used to make something special. A similar recipe yielded Piatto Pizzeria + Enoteca on Elizabeth Avenue. Price A meal for two with appetizers, wine, tax and tip costs approximately $110. Ambiance Excited, clamorous and colourful. Sound level Loud when busy. Open Sunday to Thursday from 11:30 a.m. to 10 p.m. Friday and Saturday from 11:30 a.m. to 11 p.m. Parking A large parking lot. Wines About two dozen global wines are listed, sold by the ounce, glass or bottle. Prices per glass range from $7 for a five ounce pour of Bartali Chianti to $20 for a glass of 2012 Terrunyo Carmenere. 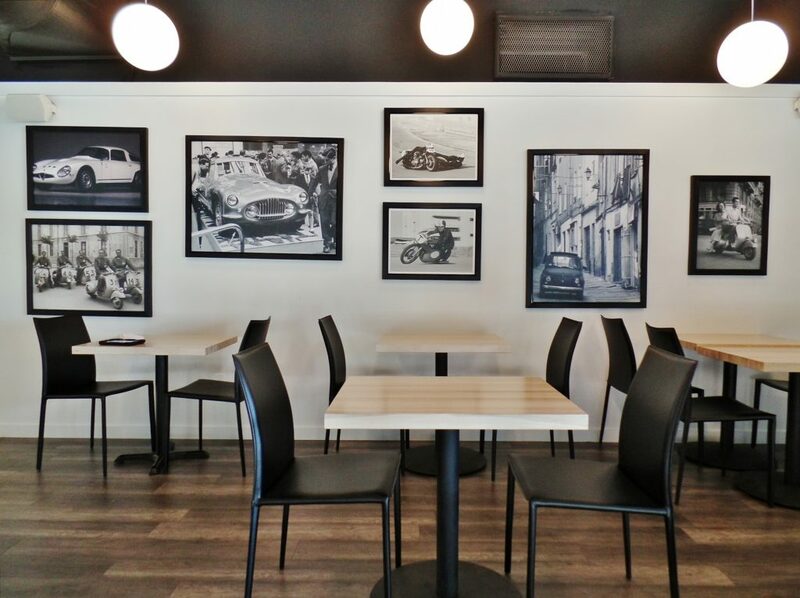 Wheelchair access Piatto on Elizabeth Avenue is accessible, with a number of accessible tables on the main floor.